How Heavy is a Bubble? This science project examines the relationship between the size of a bubble and how quickly it falls. How is the size of a bubble related to the speed at which it falls? 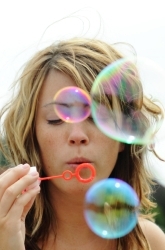 Have you ever used a bubble wand to make bubbles of all sizes simultaneously? If so, you may have wondered whether the smaller bubbles or the larger bubbles were more likely to hit the ground first. You probably can’t figure out the answer using a bubble wand, but you can figure it out using your own homemade bubble pipe. Fill the bowl with bubble solution. Poke the pencil through the side of the foam cup, near the bottom. Push the drinking straw through the hole so that it goes all the way inside the cup. This is your bubble pipe. Turn the entire bubble pipe upside down and place it into the bubble solution. Lift up the bubble pipe. Blow into the straw very gently to make a bubble form on the top of the cup. After a small bubble forms, twist the cup quickly to release the bubble. At the same time, hit the “Start” button on the stopwatch. Time how long it takes for the bubble to hit the ground. Record your data in a chart like the one below. Blow nine more small bubbles, and record how long it takes for them to fall as well. Blow ten large bubbles, using the technique described above. Record how long it takes for them to fall in the second column of the chart. Calculate the average time it took for each type of bubble to hit the ground by adding up each column and dividing the sum by 10. Compare the results. Terms/Concepts:What were the earliest bubble-blowing devices created? ; How much does air weigh? Experiments With Bubbles, by Robert Gardner. Pp 57-58. Ever wondered how bubble gum got its start? 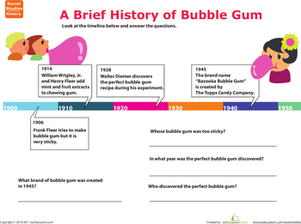 Give your child practise reading a time line with this worksheet all about the humble beginnings of bubble gum. Can you imagine a sky filled with bright, colorful bubbles? 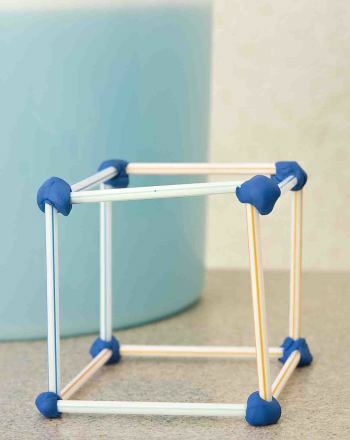 Make this whimsical scene come alive with bubble science! 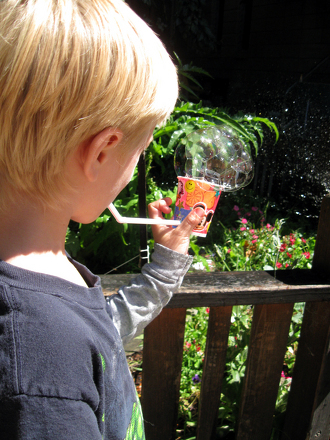 Here's a way to turn an old favorite into something new, by ditching that plastic wand for a homemade bubble pipe. Help your year one students practise identifying which items are heavy and which are light with this worksheet. 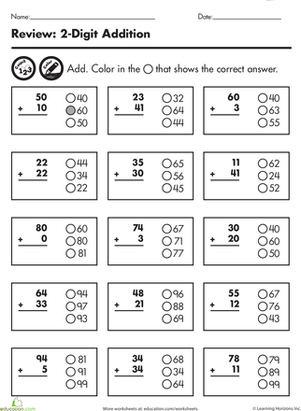 On this worksheet, kids solve each two-digit subtraction problem, then colour in the bubble next to the correct answer. Here's a great review sheet for two-digit addition. Kids solve each problem then colour in the bubble next to the correct answer. 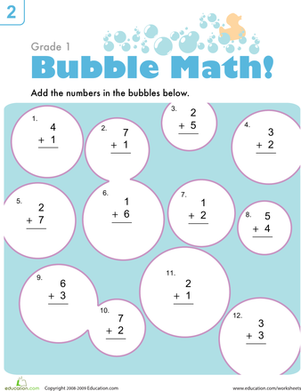 This bubble-filled year two maths worksheet makes practising addition fun. 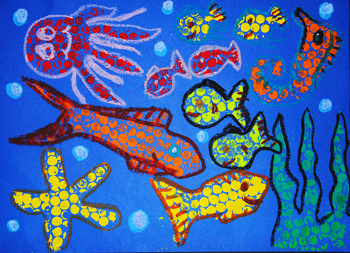 Your child will practise addition as she solves the problems in the bubbles. Use this bubble map to compare two things in a visually-appealing way.